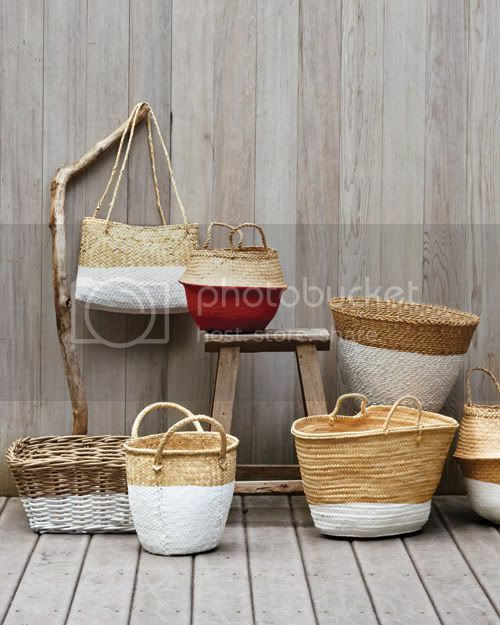 I don't know about you, but this totally caught my eye over at Martha Stewart's website recently... Dip-dyed baskets, in particular, those cute totes that you see at the weekly farmers' markets made of straw with the leather handles. I have a couple of them, they're a dime a dozen where I live so they are easy and cheap to come by. I love the idea of dip-dyed totes using white paint, or I bet silver would look fab too. These are so fresh and summery. I'd like to have a few of these baskets in my home - maybe one in the living room for magazine storage and another in the kitchen to hold Pellegrino bottles? Here is how to make these beauties.